How do you tote your kit? Discussion in 'Creative Pursuits' started by JohnE, Sep 19, 2012.
www.kgear.com packs for lenses + body with small lens mounted within a large Camelbak backpack. Lowepro Omni Trekker. Converts from shoulder to attache to backpack. 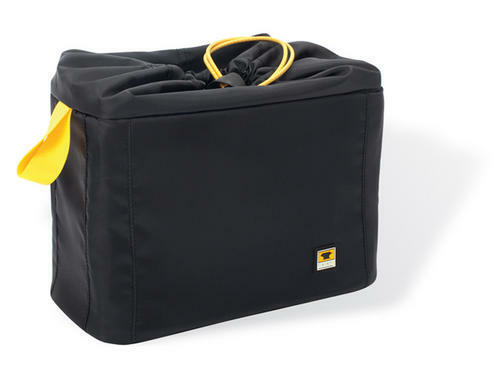 Holds 1-2 bodies, 3-5 lenses, 2 speedlights, swivels, chargers, cables, etc. Can even hold a full size tripod on the outside. Either a small or medium Timbuk2 bag with a Mountainsmith "Kit Cube" inside. Holds a body, 1-2 lenses and maybe a speedlight. Has a drawstring, stuff sack type closure so inside a Timbuk2, it's pretty much rain proof. Can be put inside most any bag, case, backpack, etc. My gear stays for the most part inside a Lowepro mini trekker. Its okay at best as far as backpacks go, if I had to lug my gear around for any length of time that wouldn't be my first choice. It currently has a body and four lenses, two speedlights, set of pocket wizards, and some miscellaneous stuff in it. For hiking I'll usually take my Lowepro Photo sport. I like this pack a lot, it'll hold the camera and either a small prime or flash in the camera compartment plus some snacks, spare clothes, and any other little things in the top compartment. It can take a hydration bladder and is a pretty versatile pack. Carries the weight well. I also have a clik chest pack which works well when I'm hiking and need the use of both hands for one reason or another. Lastly I have a Patagonia messenger bag with a tenba insert that'll take a camera plus lens plus flash. It's a fair amount of weight to carry across one shoulder and can get pretty uncomfortable if you lug it for any amount of time. I'm still looking for the ideal pack. Still haven't found it yet. For hiking I usually take one camera and lens. Sometimes a flash. So it just goes into my day pack, or would if it wasn't around my neck the whole time. Elsewhere I usually use my messenger bag. It's not perfect, but I already have it, and it works. Some day I'd like something like a Domke F2. I don't have enough stuff to fill it though. One question matters here: Are you going to be riding/boarding/skiing with it? I got that Mountainsmith insert for like $25 at REI. It turns any messenger bag into a better-than-a-Domke-bag in my opinion. I don't get the appeal of Domke bags anyway. They are canvas with thin padded inserts (which are shoddily sewn) and sh1tty steel hook clasps that are a pain to open, and all for a ridiculous amount of money. WTF? If I was riding or doing anything else that might risk impact, I'd spring for a Boblbee hard shell pack and a photo insert. Not that it would save the camera if the impact was great enough, but it would fair better than any soft sided pack. i dont. i leave the dslr in the car. i have the gopro for that. set it up for pictures every 2 seconds, and pray for a good picture to come. i had a case logic bag, it had like a suspension thing for the camera. excellent bag, had room for a body+big lens + 1 extra lens, plus small pockets. (got stolen with all my stuff though). now i carry my stuff in a $35 canon bag, which has proved to be good for travel (if carried on the waist), since it holds my camera, passport, wallet, deflated neck pillow and small random travel things. http://fstopgear.com/product/mountain/tilopa-bc as well as a few other of their small ones. Absolutely love these packs. went downhill riding, to a big hill next to a slum... my window was broken, and they stole my camera plus 2 lenses, bag, xc helmet, camelback, bike tools, radio, wallet.... they forgot to take out the tv and the dvd player (they were hooked to the roof, and apparently, they didnt notice them). That's funny if you say it in your head with a Hunter S. Thompson voice. Bonus points if your wife has a suitcase full of hallucinogens. i have, seriously, had this conversation with my wife. me: "in the event i caught a bike thief, or a car burglar. how liable will i be if i tied the guy to my hitch and dragged him for 2 miles, and how can i avoid/diminish it?" me: "no, but seriously.... if i put a helmet on the guy... could i claim i had no intention of inflicting lethal harm"... "would that improve my standing in case of a legal proceding?"... "whats the most i could do, and how i could do it, in order to have the best standing for when legal issues came?"... "i dont mind a fine and being under parole, as long as there is no effective jailtime"
wife: "dont you ever try it. i swear i wont come to court if you do". me: "dont worry... am just asking, besides, you dont have to come.. my sister is also a lawyer". wife: "dont you ever dare, am serious...."
I second this, though depending on the ICU you have, it can be a lot of unnecessary pack/weight. Great pack for splitboarding/AT though. I even travel with mine a fair amount. I'd look for a deal on a Lowepro/Thinktank/etc. in the size you want. Lowepro stuff ends up on closeout sometimes. The f-stop packs are drool worthy, but do you really need a downhill rig for a fireroad? How much gear do you intend to carry? carrying sh!t...it's what his kids are there for. Yeah that f-stop stuff is perfect for skiing. It's pricey but it's setup for being out in the snow......especially for some backcountry gear.